I want 2 to blog ..
School starts in just a little over a week. THANKFULLY. It will be nice to have quiet in the house for a while. Will only have about 2 1/2 hours with all 4 kids at home before Jason gets home. That is nice. His schedule changed this morning ... he only had to go to work for 7:30am. It was nice to snuggle this morning a little before he had to go. Just quiet time ... always nice. Musical dress rehearsal all day Saturday -- Jason has to be there to help on Saturday morning, kids have to be there for 1pm. Praying for Brandi and her stress level during this ... I think it's going to be great. Ok, that is all for now. Need to go and get a few things done before Jason gets home from work. It's been months since I've taken the time to sit and type out a blog post. Forgive me? HA, is there really anyone reading this to answer that question? Doubt it very much! :) But, oh well - at least it's there for me to go back to and read - if I ever take the time. Soon we will be celebrating Samuel and Jenna's 3rd birthday - wow! Where has the time gone?? Can't believe they will be 3 years old ... and that means, it will be 3 years since I've seen my parents and sister .. and I know how much that upsets them .. especially my dad, because I told him that I would see him in less than 2 years. OOPS! Who knows when we will get the chance to go up to Canada to visit them. Especially now with the ticket prices so much -- and such a long drive!!! blah. Procrastination. 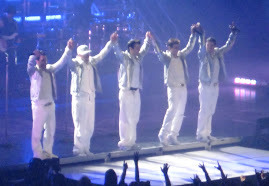 Concerts - I've seen NKOTB 2 times since I last posted. I saw their opening show for the Full Service Tour in Atlanta - in June and also saw a show in Memphis in July. I was hoping to attend the last show of the tour in Texas on July 18th .. but we just couldn't do it. LOL ... no way were we adding 400 miles to our trip to Oklahoma .. although it would have been AMAZING to be there. :) Now, here's waiting on what will be next (my friend Shannon is trying to convince me to go on the May cruise -- but there is just no way I can justify spending that much money on a NKOTB tour). LOL ... so, who knows what will be next. Jason and I just celebrated our 11th wedding anniversary ... July 18th. Along with my friend Rachael and her husband, Jeff. Who knew we would ever become great friends and share that special day!! :) We were driving to Oklahoma on our anniversary ... and we got to go out twice (once to the Melting Pot here and once at the Cheesecake Factory in Oklahoma) ... I can't believe it's been 11 years!! WOW! Not sure what else to write, so I guess that I will end with that .. Hope that you all have a blessed day!